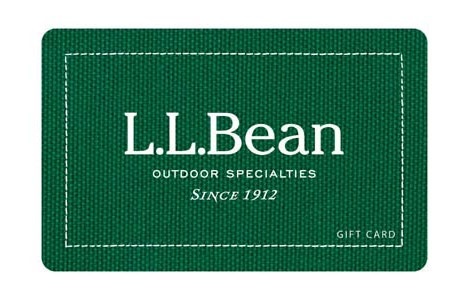 With more than 100+ years of legendary service and quality products, L.L.Bean Gift Cards are a great solution for business incentives, rewards and loyalty programs. Gift Card recipients can choose from thousands of items including apparel, home goods, outdoor gear and more, all backed by L.L.Bean’s 100% Satisfaction Guarantee and Free Shipping all the time. No expiration date or added fees. Redeemable toward any L.L.Bean or L.L.Bean Signature product or Outdoor Discovery Schools course, trip or tour. Accepted online, by phone or at any L.L.Bean store or outlet. L.L.Bean Gift Cards cannot be redeemed for cash (except where required by law), applied to an L.L.Bean Visa Credit Card account, or applied to a discounted Direct to Business order. Please treat gift cards like cash, as they cannot be replaced if lost or stolen. See llbean.com for Free Shipping details. Terms and conditions are applied to gift cards/certificates. Please see the merchant gift card/certificate or the merchant website for additional terms and conditions which are subject to change at merchant's sole discretion. Use of merchant names and/or logos is by the permission of each respective merchant and all trademarks are the property of their respective owners.